James Harden drives to the basket during a game this season. Harden’s 36.5 points per game this season leads the NBA. Photo by Troy Taormina/USA Today. What James Harden is doing is absolutely ridiculous. The last time he scored less than 30 points was Dec. 12 against the Portland Trail Blazers. It is indisputable that what he is doing is incredible. But it does not matter. At all. 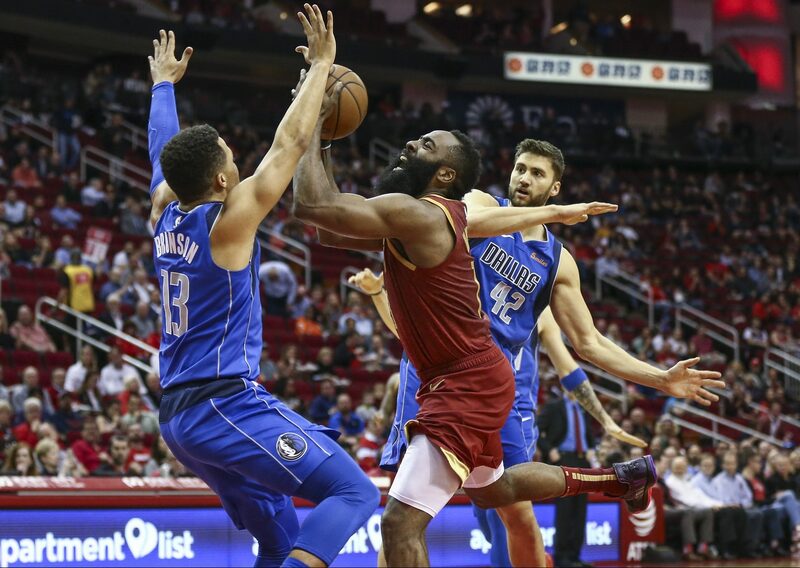 In the 29 games the Houston Rockets played between Dec. 12 and Feb. 10, they are 20-9. Against current playoff teams, they are only 8-6. On top of that, it took 48 points from Harden to beat the LeBron-less Lakers by four and 61 points to beat the Knicks by the same amount. In those two games, Harden took 68 shots combined. Only one player not named Harden scored more than 20 points in either contest. An astronomically high shot volume is not a sustainable form of basketball when it comes to winning championships. Even Kobe Bryant, who once took 46 shots in a game, knows that is not a way to win rings. “So, there’s the style of play in which he’s using, which I’m not a fan of in terms of winning championships. I don’t think that style’s ever gonna win championships,” Bryant said in a USA Today article about Harden. The Rockets are never going to win playoff series against title contenders the way they are playing basketball right now. And it is not because they do not have the talent to do so. Obviously, Chris Paul, Eric Gordon and Clint Capela, accompanied by solid rotation pieces, are good enough to win four of seven games. But the amount of shots Harden is taking makes the room for error very small. Harden does not know how to function in an offense where he is not the only guy with the ball. Unfortunately, his partner in crime, CP3, is at his best with the ball in his hands making plays for other players, so Harden takes away from Paul’s effectiveness. The Warriors are good because every single one of them can play both on the ball and off it. Kevin Durant might be the best pure scorer the NBA has ever seen, but he has found a way to be just as effective without having the ball in his hands 24/7. The same goes for Stephen Curry, who moves without the ball better than anyone. So sure, Harden might go for 37 points like he did against the Pelicans on Jan. 29. But when it takes him 32 shots to do it, it means there were at least 10 possessions when Harden went into isolation and took a shot that cannot possibly be the best shot for his team. The problem: this is a more effective use of Harden than putting him into a real offense. The Rockets offense is isolation-heavy, depending on players to beat their man one-on-one to create opportunities for his teammates. Because he is so good, this offensive model usually works during the regular season, but it only takes a semi-poor shooting night to put the Rockets in a really tough position. Especially against playoff-caliber teams. If the playoffs started Feb. 12, the Rockets would be playing the Trail Blazers, a team who is winning the head-to-head series two games to one. In the most recent loss, Harden scored 38 points, but he took 35 shots and went 5-of-17 from beyond the arc. As a result, the Rockets got beat easily by a Portland team that features multiple big-time scorers and two other double-digit scorers on that particular night. Then there is the issue of the playoffs, a time of the year where Harden’s numbers consistently fall off from where they were in the regular season. Last season, when Harden won MVP, he averaged 30.4 points, 8.8 assists and 5.4 rebounds while shooting 45 percent from the floor and 37 percent from deep: unreal numbers. He definitely deserved the recognition of MVP. However, in the playoffs, he averaged 28.6 points, six assists and five rebounds. His efficiency dropped to 41 percent from the field and just 29 percent from deep. These numbers do not sound like massive drop-offs, but when Harden plays the way he does, it takes a bigger impact because of how central he is to the Houston offense. Harden simply puts too much effort in the regular season. Remember how gassed he looked in Game 7 against Golden State in 2018? He ended up with 32 points but went 2-for-13 from 3-point range. There is a reason Gregg Popovich always gets the best out of his teams in the playoffs. It is because he does not care about the regular season as long as they play well enough to get to the postseason. Harden is not wired that way, and it comes back to bite him every year. What James Harden is doing is incredible, no doubt. But so was what the 2016-17 Warriors did by breaking the wins record. When the Warriors didn’t win a title, their record became irrelevant. Harden is great, but the way he plays does not translate to the playoffs, so ultimately what he does falls into the same category of irrelevance. Michael Jordan averaged more than 30 points per game eight different times throughout his career. What he’s remembered for is his six championships. Russell Westbrook is on his way to averaging a triple-double for the third straight season, but he’s often described as a player detrimental to his team in the playoffs. It ultimately doesn’t matter what you do in the regular season if you can’t capitalize in the playoffs. Nobody is remembered for how awesome they were in the regular season; what ultimately dictates their legacy is what they do in the postseason. If Harden continues to approach the game this way, he’s in danger of falling into that same category.